Completed in 1894, the Natural History Building at the University of Illinois at Urbana-Champaign (UIUC), serves as one of the first campus buildings. The landmark building houses the School of Earth, Society, and Environment and the School of Integrative Biology. Designed by Illinois architect and Urbana alumnus Nathan Ricker, the Natural History Building set the architectural tone for the remaining campus. The registered historical landmark had three major additions since its completion. However, these additions rendered the building more complex, making it difficult to navigate in and between the new spaces. In 2010, structural deficiencies found in the 1908 addition forced Illinois to seriously consider a major overhaul to the facility. In 2012, Illinois at Urbana-Champaign commissioned LCM, a Chicago-based architecture firm, to design the future of the Natural History Building. Prior to the renovation, the two schools occupying the Natural History Building identified key principles to guide the design process. These unifying themes included: sustainability, nature, and tradition. Together, such themes translated to a design that would unify fragmented spaces, improve circulation, and provide modern educational research facilities, all the while maintaining the building’s historic character. In addition, LCM and Illinois agreed that the renovation was an opportune time to address some of the ongoing challenges the Natural History Building faced. Functionality and an attractive environment for students, faculty,and staff were key priorities in preventing the new space from continuing to exist as a transitory space. Illinois at Urbana-Champaign also wanted to have a space that made students want to remain in the Natural History Building after class,either to catch up or collaborate. With the above drivers in mind, LCM proposed a complete interior renovation with the condition to repurpose as much of the pre-existing natural wood elements, including doors, trims, floors, ceiling and wall panels. Not only did this decision act to physically preserve part of the original Natural History Building, but also to re-cast the building’s long history in a contemporary context. Such preservation honored the initial guiding principle of sustainability. 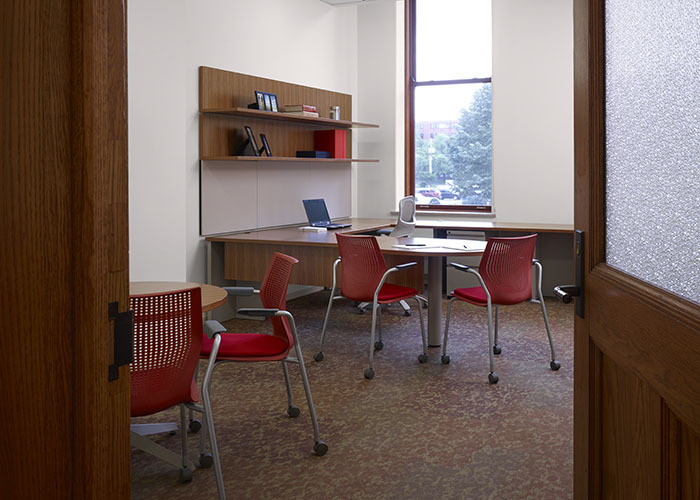 With over 90 private offices and 180 workstations across 4 floors, 7 conference rooms, 13 lounges,and 32 classrooms, the Urbana campus, LCM and Knoll Dealer, Resource One, worked closely together to select a range of products that would solve for the University's original drivers. In response to the abundance of natural wood, Resource One, positioned Reff Profiles™ as the benching solution.Complementing the natural wood, Reff Profiles delivers a progressive and architectural design solution that is both sustainable and enhances the building's sense of tradition. In addition to Reff Profiles, Illinois incorporated Dividends Horizon® workstations, offering a robust and versatile solution, as well as a consistent and clean aesthetic. Dividends Horizon works to provide an updated look and feel, one that will attract and retain. Echoing the focus on sustainability, Generation and ReGeneration by Knoll®, with their recycled make up, offer unparalleled ergonomic support, inviting students and faculty to work and spend time in the Natural History building rather than finding an alternative space. Many of the new learning spaces, from peer-to-peer classrooms to visualization labs to graduate student spaces, demanded flexible and efficient furniture above all. Illinois at Urbana-Champaign stressed that furniture had to be easily re-arranged for a variety of spaces.Resource One recommended Propeller® Training Tables and Antenna® Simple Tables as a cost effective and versatile solution. Linkable and boasting a contemporary and neutral aesthetic,Propeller and Antenna tables can be arranged in a countless number of variations and integrate power in a streamlined manner. Illinois paired the classroom tables with MultiGeneration by Knoll® Stacking Chairs in dark red. With a responsive open design that supports multiple postures, MultiGeneration by Knoll encourages spontaneous collaboration. Casters and a stacking base allow the chairs to be easily moved out of the way or gathered together depending on the task at hand. As a final touch to the renovation, Illinois at Urbana-Champaign wanted the building to resonate with students, faculty, and the local community. In the main entrance lounge, Risom Lounge Chairs not only complement the elegance of the restored wooden staircase, but also promote school colors with their orange webbing. 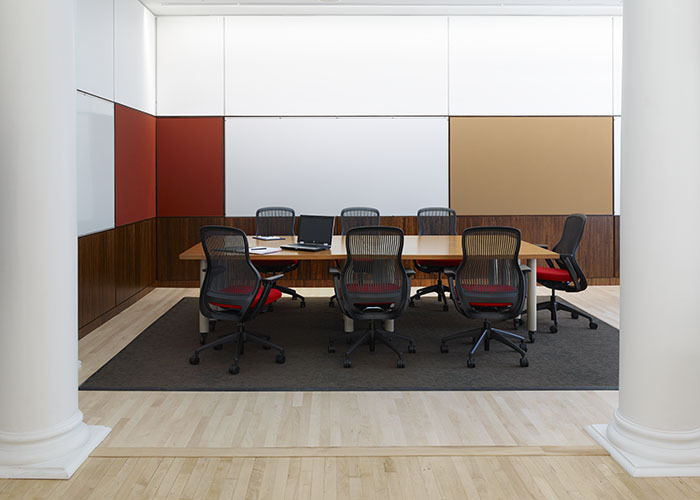 In addition, Illinois used orange upholstery and wall coverings from KnollTextiles to further promote school spirit. The Natural History Building has seen many renovations, but none like the latest. Proposing a complete overhaul of the interior, from re-purposing building materials to installing new skylights to creating new teaching spaces, LCM, in conjunction with Resource One, successfully gave the Natural History Building a contemporary look while maintaining the building’s original feel.Leading drivers such as sustainability, collaboration, and attraction and retention dictated the various choices along the way. The aesthetic of KnollStudio classics, the versatility of KnollOffice tables, and the sustainability of Generation by Knoll and Reff Profiles, together solved for the proposed challenges laid out back in 2014. The Natural History Building now stands as a modern landmark, replete with the teaching and learning spaces for necessary today’s students. Knoll Dealer: Resource One of Illinois Ltd.